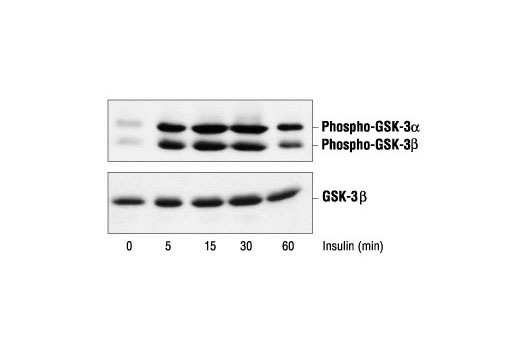 Background: The Grb-associated binder (Gab) family is a family of adaptor proteins recruited by a wide variety of receptor tyrosine kinases (RTKs) such as EGFR, HGFR, insulin receptor, cytokine receptor and B cell antigen receptors. 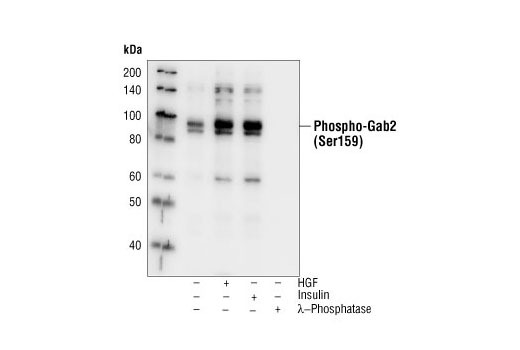 Upon stimulation of RTKs by their cognate ligand, Gab is recruited to the plasma membrane where it is phosphorylated and functions as a scaffold (1-4). 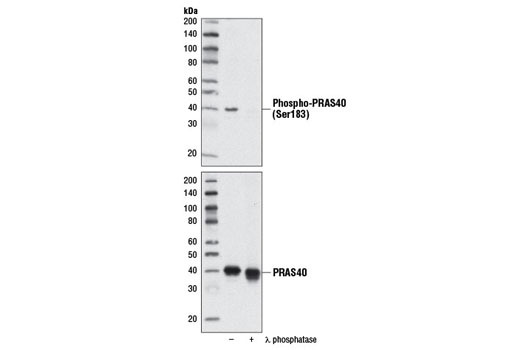 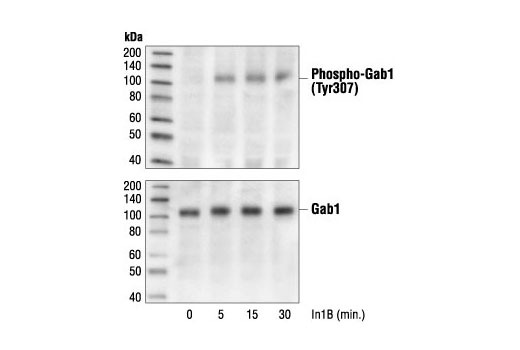 Multiple tyrosine phosphorylation sites of Gab1 protein have been identified (5). 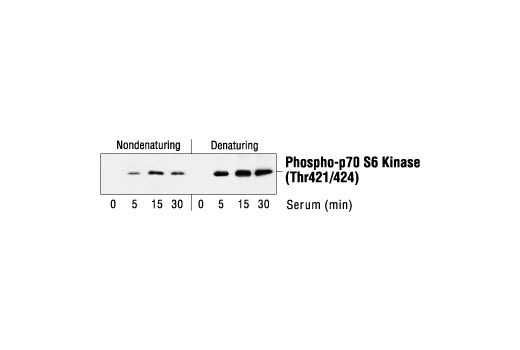 Phosphorylation of Tyr472 regulates its binding to p85 PI3 kinase (6,7). 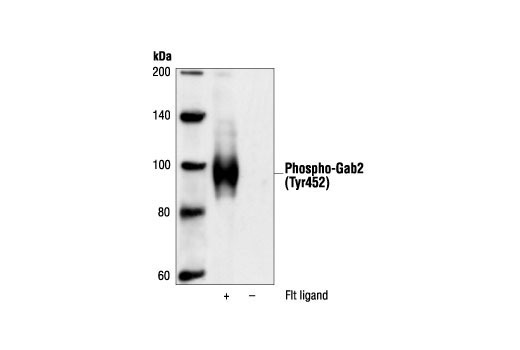 Phosphorylation of Gab1 at Tyr307, Tyr373 and Tyr407 modulates its association to PLCγ (8). 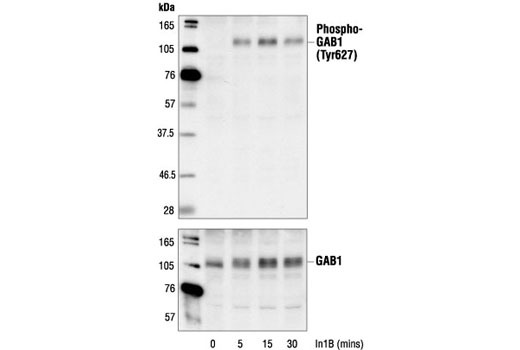 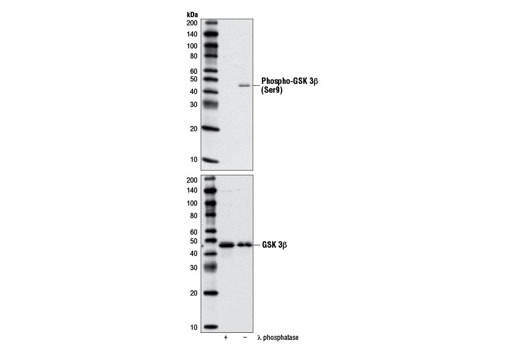 Phosphorylation of Tyr627 and Tyr659 is required for Gab1 binding to and activation of the protein tyrosine phosphatase SHP2 (6,9). 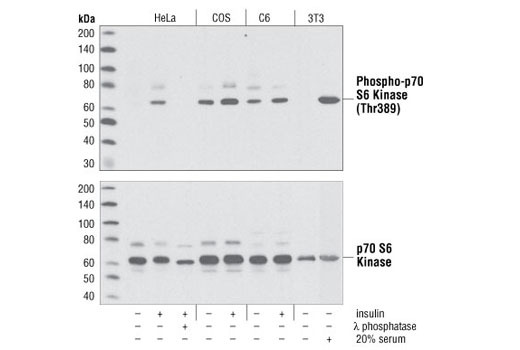 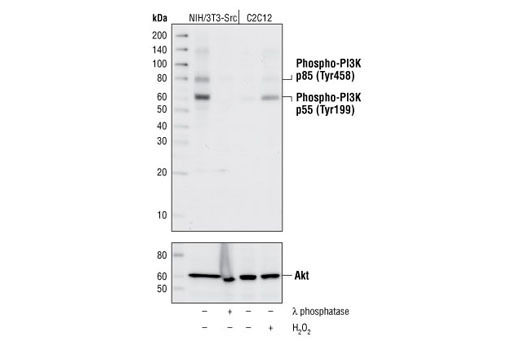 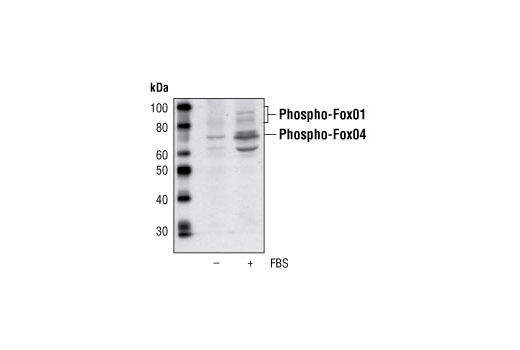 Background: Phosphoinositide-dependent protein kinase 1 (PDK1) plays a central role in many signal transduction pathways (1,2) including the activation of Akt and the PKC isoenzymes p70 S6 kinase and RSK (3). 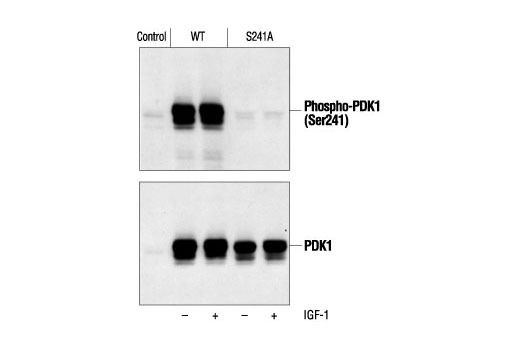 Through its effects on these kinases, PDK1 is involved in the regulation of a wide variety of processes, including cell proliferation, differentiation and apoptosis. 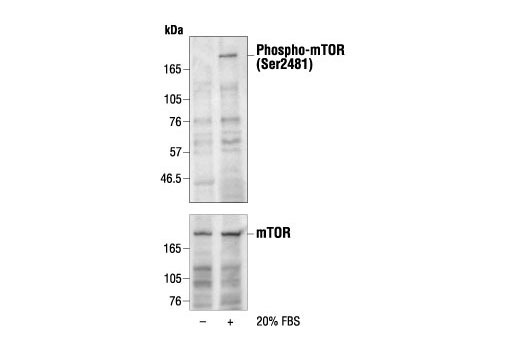 Background: The regulatory associated protein of mTOR (Raptor) was identified as an mTOR binding partner that mediates mTOR signaling to downstream targets (1,2). 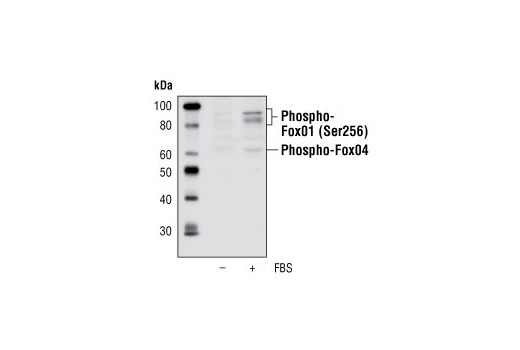 Raptor binds to mTOR substrates, including 4E-BP1 and p70 S6 kinase, through their TOR signaling (TOS) motifs and is required for mTOR-mediated phosphorylation of these substrates (3,4). 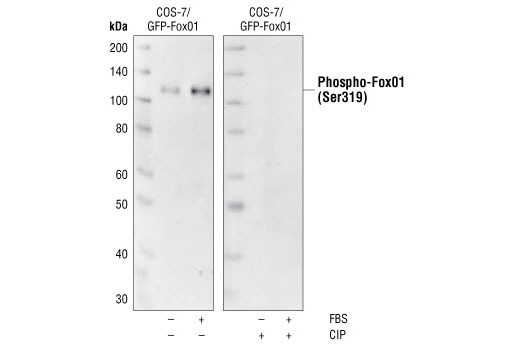 Binding of the FKBP12-rapamycin complex to mTOR inhibits the mTOR-raptor interaction, suggesting a mechanism for rapamycin's specific inhibition of mTOR signaling (5). 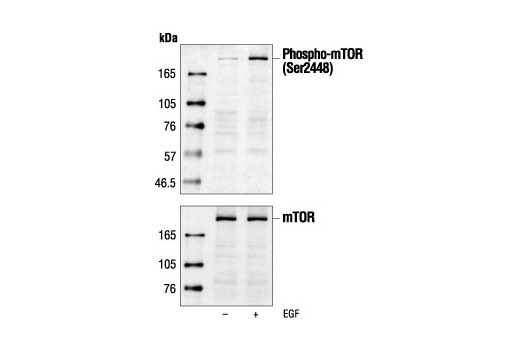 This mTOR-raptor interaction and its regulation by nutrients and/or rapamycin is dependent on a protein called GβL (6). 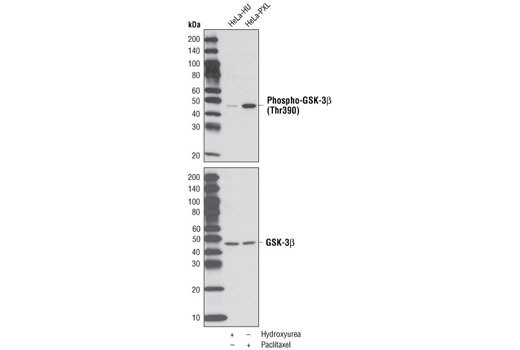 GβL is also part of the rapamycin-insensitive complex between mTOR and rictor (rapamycin-insensitive companion of mTOR), and may mediate rictor-mTOR signaling to downstream targets including PKCα (7). 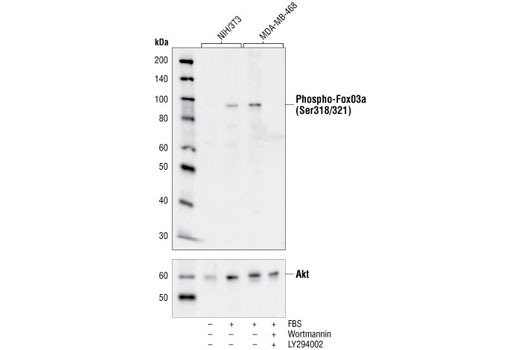 Furthermore, the rictor-mTOR complex has been identified as the previously elusive PDK2 responsible for the phosphorylation of Akt/PKB on Ser473, facilitating phosphorylation of Akt/PKB on Thr308 by PDK1 and required for the full activation of Akt/PKB (8).Recently raptor has been identified as a direct substrate of the AMP-activated protein kinase (AMPK) (9). 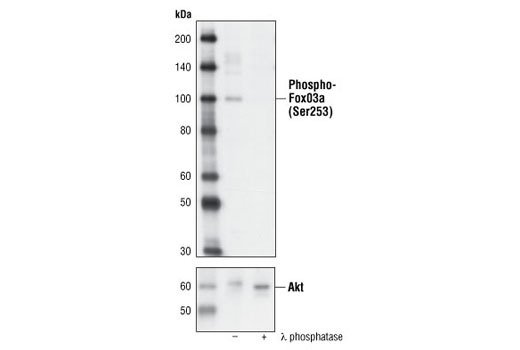 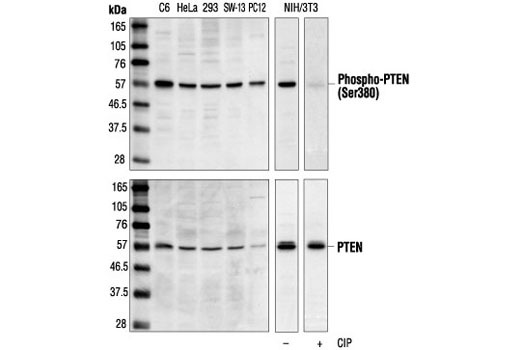 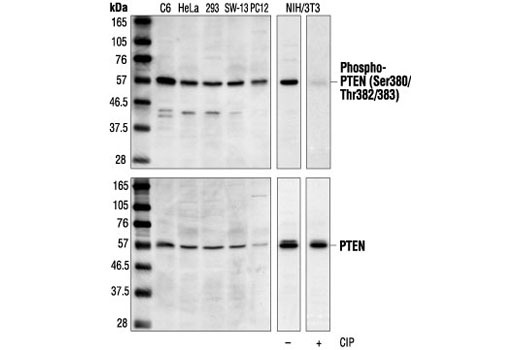 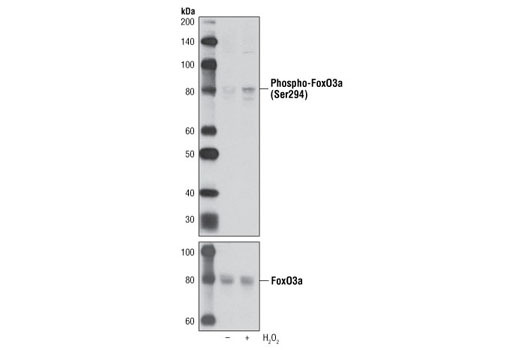 AMPK phosphorylates raptor on Ser722/Ser792 (9). 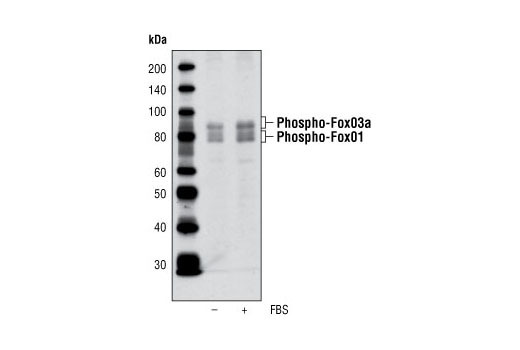 This phosphorylation is essential for inhibition of the raptor-containing mTOR complex 1 (mTORC1) and induces cell cycle arrest when cells are stressed for energy (9). 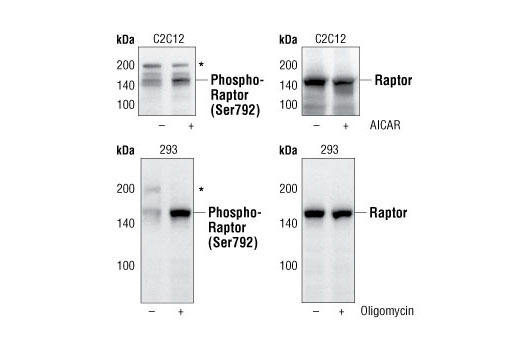 These findings suggest that raptor is a critical switch that correlates cell cycle progression with energy status. 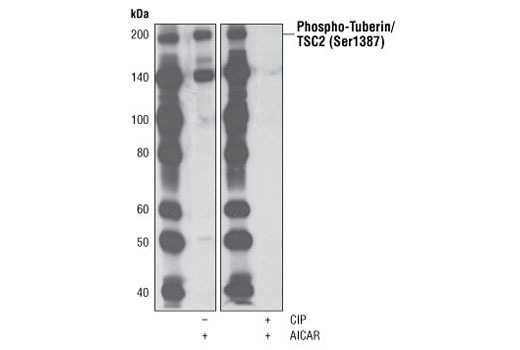 Background: Tuberin is a product of the TSC2 tumor suppressor gene and an important regulator of cell proliferation and tumor development (1). 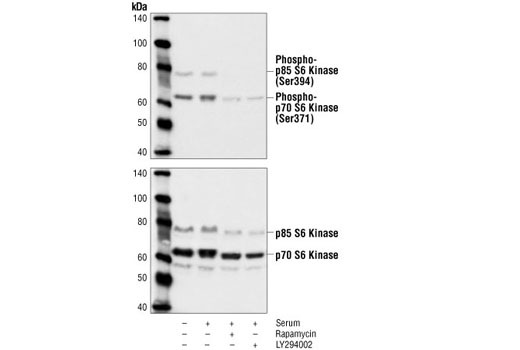 Mutations in either TSC2 or the related TSC1 (hamartin) gene cause tuberous sclerosis complex (TSC), an autosomal dominant disorder characterized by development of multiple, widespread non-malignant tumors (2). 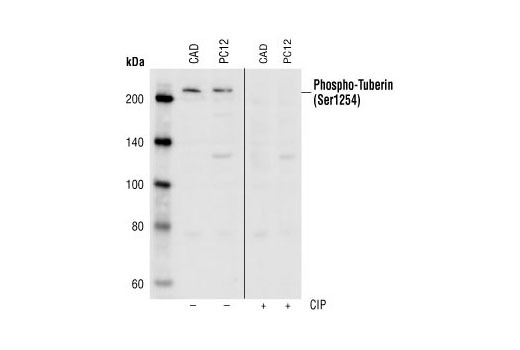 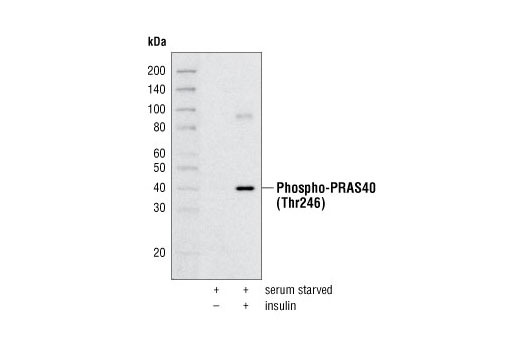 Tuberin is directly phosphorylated at Thr1462 by Akt/PKB (3). 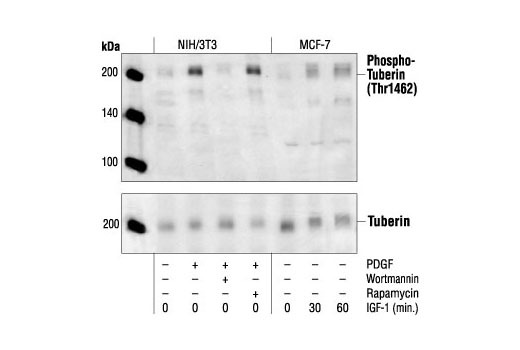 Phosphorylation at Thr1462 and Tyr1571 regulates tuberin-hamartin complexes and tuberin activity (3-5). 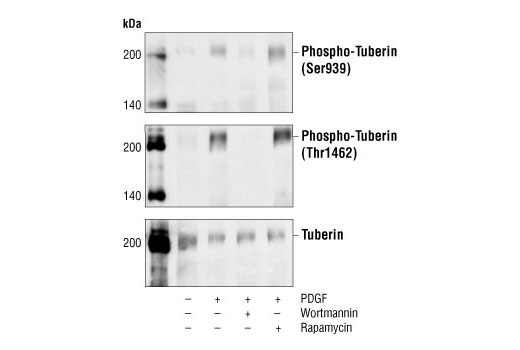 In addition, tuberin inhibits the mammalian target of rapamycin (mTOR), which promotes inhibition of p70 S6 kinase, activation of eukaryotic initiation factor 4E binding protein 1 (4E-BP1, an inhibitor of translation initiation), and eventual inhibition of translation (3,6,7).